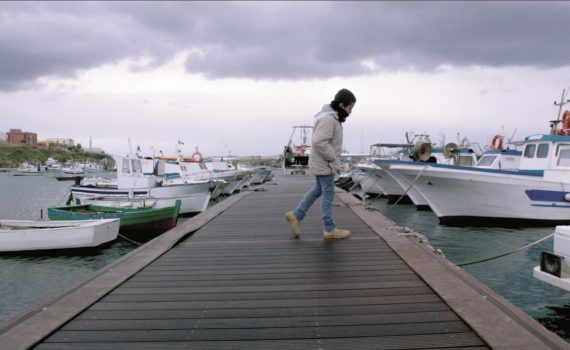 Up for Best Documentary at this year’s Oscars is Fire at Sea, a simple and unblinking look at the refugee crisis, specifically as it relates to a small Italian island and the people who live there. That might sound intriguing, you might be intrigued, you might be saying to yourself, “now that sounds like a documentary I would watch, a relevant topic set against a beautiful locale, a humanitarian piece brought to light in a wonderful way.” But you’d be dead wrong; this film has got to be the most boring documentary I have ever seen. I know I’m a film critic, I should be able to find greatness in simplicity, but this is a bad movie from start to finish, something that puts to sleep instead of informs, which can’t help spread the message, I wouldn’t think. The island of Lampedusa marks the front line in the refugee crisis, boatloads of terrified Africans streaming across in an attempt to leave war and famine behind. Unsound, not supplied, and carrying too many passengers, these ships often sink, killing the women and children aboard, requiring rescue operations, and exemplifying the desperation of the people who would risk their lives to reach a better place. Life goes on for those who call the island home, as the arrival of refugees becomes a part of the daily existence, and those who wish to help make these newcomers a part of their world. This dot on the map serves as a microcosm for the greater problem, drawing our attention to a situation that might happen anywhere. I’m not alone in this; watch this film before going to bed, that’s about all it’s good for. I don’t mean to belittle the true story, it’s very important, but Rosi failed to bring it to life, killing any fervor in an attempt to become ultra-realistic. He pans about with his cameras as if they were all stationary, set up with motion sensors hoping to capture something worthwhile. This is not a joke, you can literally watch the movie at 3x speed and not miss a single thing. Actually, you can still read the subtitles and the action seems like it’s finally moving at real speed, so fast forward away, watch it all in 35 minutes, save yourself some time. Or, instead, read an article, donate to a cause, but skip this film, because it is very poorly-made, extremely boring, never captivating, and I have no idea why it’s up for an award of any kind.